As a longtime Band Together NC fan, I’m pretty excited about this year’s chance to “Shut Up and Dance!” for a great cause. 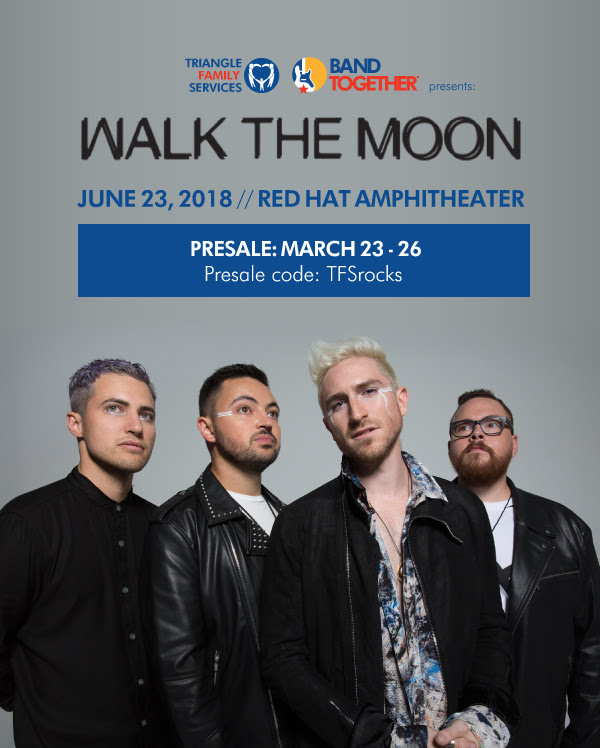 Walk the Moon will headline Band Together’s Main Event on Saturday, June 23, 2018 at Downtown Raleigh’s Red Hat Amphitheater. This event is the southeast’s largest charitable music event and each year picks a new local organization to support with their fundraising efforts. The 2018 beneficiary is Triangle Family Services – proceeds raised during the 2018 partnership year will be used to provide access to mental health services for up to 600 individuals in our community. Tickets will go on sale Tuesday, March 27th through E-tix. A special pre-sale offer is available starting Friday at 10 am with the code TFSrocks. For ticket information or to learn more about Band Together and the event, visit www.bandtogethernc.org. To learn more about Band Together’s 2018 nonprofit partner visit, https://www.tfsnc.org/. This year, through community support and corporate and individual donations, Band Together and Triangle Family Services aim to raise $1 million. Ohio’s Walk the Moon have been captivating audiences with their energetic live shows for the better part of a decade. The band first made a name for themselves by touring relentlessly in support of their self-titled debut, which featured the indie classic “Anna Sun.” The alt-rock-pop quartet was then catapulted into the spotlight when 2014’s “Shut Up and Dance” became a multi-platinum global smash, crossing sonic barriers to top three different Billboard charts. After two years of performing countless sold out shows in twenty-five countries across five continents, the band returned to the studio to craft their third major label release, 2017’s What If Nothing. The new album shows the band simultaneously at their most epic and their most vulnerable, a daring step forward both musically and lyrically. Band Together has an amazing story. A vision begun 16 years ago, Band Together was imagined as a response to the tragedies of September 11, 2001. More than a decade later, and thanks to the tireless efforts of thousands of volunteers, generous corporate and individual sponsors, dedicated board members and the generosity of our community, Band Together has risen to be a powerful partner to nonprofits in the Triangle Area. Band Together has raised nearly $7.8 million to benefit the Triangle community since its 2001 inception, helped change lives and had fun along the way. We are the Mullet. Business (and social good) in the front, party in the back.